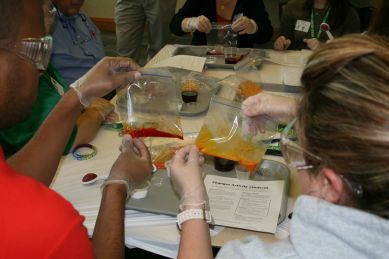 Alabama 4-H educators are mastering inquiry-based learning methods to provide Alabama young people with the fluid learning environments they will need to succeed in this new globalized economy. The further I advance into middle age, the more I’m convinced that a few things in life really are simple — not necessarily easy, mind you, but simple in terms of understanding their fundamental nature. For example, I think a few very gifted and insightful science and tech writers, notably Steven Johnson, have successfully identified the key factors that account for the West’s technological triumph over the past century. At the heart of all lies a strong commitment to openness. As Johnson contends, the roots of this openness can be traced to the coffeehouses of the 17th century — boisterous places that provided the ideal environments for sharing ideas. Something rather remarkable and entirely unexpected followed: The ideas exchanged within those highly fluid environments ended up mating and mutating into new ideas. Many of these ideas formed the basis for huge strides in scientific innovation which, in turn, secured immense material benefits for billions of human beings over the next 300 years. Unfortunately, within the last few decades, American education has lost sight of this fundamental insight. Fortunately for us, a few educational trailblazers, Newcastle University Professor Sugata Mitra and educational speaker, author and adviser Sir Ken Robinson are pointing the way back to them. I’m proud to report that another group of educators much closer to home are also pointing the way: Alabama Extension 4-H administrator Lamar Nichols and the educators and professionals of Alabama 4-H.
Having spent the last couple of days at their annual priority team meeting, I think it’s highly likely that they will be remembered decades from now as vanguards — people who set the standards for youth educators in the 21st century. They understand the implications of this emerging information/technological order as few others do. The world is changing. We all know that. Digitization is the reason for much, if not most, of these changes. We know that too. Yet, contrary to what a lot of people think, it’s not only about adopting iPhones or learning how to tweet. Technological adoption is only part of what we must do. At the heart of it all is the critical need to understand the different kind of society that is emerging from all these technological changes. While it’s partly about technological adoption, it is most of all about learning to think and act in a fundamentally different way. To put it another way, it’s mostly about how to create optimal learning environments— ecosystems of knowledge in which people are to able share ideas freely and openly and that bear a strong resemblance to those raucous coffeehouses of the 17th century. Alabama 4-H understands the dire importance of restoring this understanding of the fundamental factors that drive human innovation and progress. What 4-H educators call inquiry-based learning provides the same thing as 17th century coffeehouses: fluid knowledge environments where ideas can be exchanged freely and with the greatest chance of their mating and mutating into even bigger ideas. 4-H educators understand that creating these kinds of environments among young people will be critical to ensuring that rising generations of young people develop a working knowledge of science, technology, engineering and math — STEM, to use a highly appropriate acronym — factors that will be key to this nation’s global competiveness over the next century. They’re creating these fluid learning environments to complement what is being taught in the state’s science and math classrooms. By addressing this critical need, Alabama 4-H educators, in addition to setting a benchmark for other 4-H youth development professionals, are drawing us closer to a vision of the new model Extension educator of the 21st century.